Seligman (1973) referred to depression as the ‘common cold’ of psychiatry because of its frequency of diagnosis. Have you noticed how many people have depression these days? Picking up from the first part of this series, let’s take a look at the two keys that I believe will change everything. As I mentioned before, these keys are not only for depression but for life itself. I am not saying it is easy. It’s not. In fact at first it is flippin’ difficult! If you are used to one way of doing things then changing to another is really hard but only at first, it gets easier. The main thing is to look at what you are facing and force yourself to look at alternatives to how you feel. Do you feel sad then is there anything in it that is not so bad? 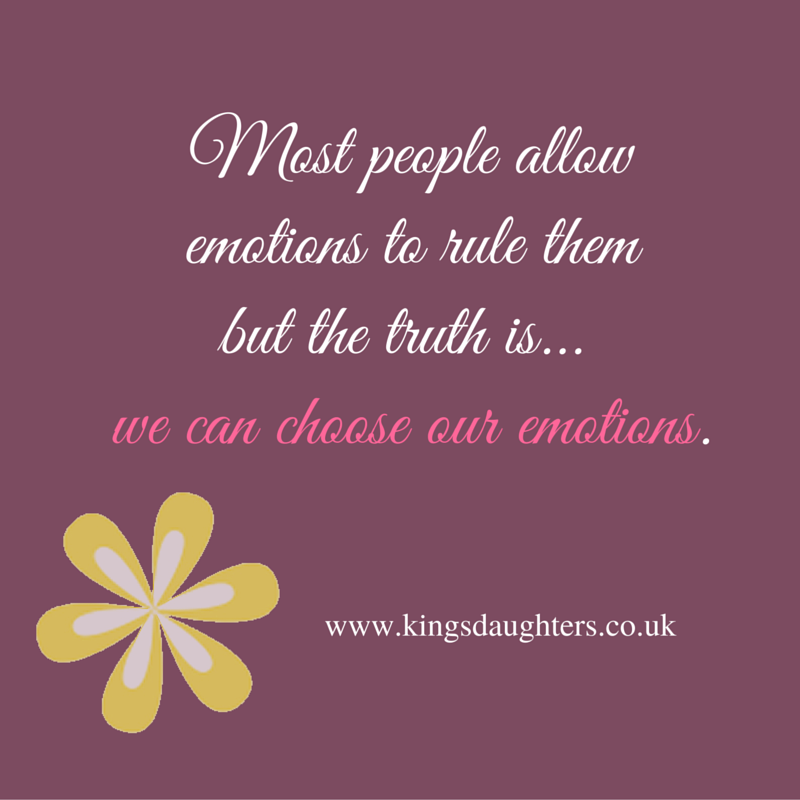 Do you feel angry then is the anger necessary or are you overreacting when it’s not such a big deal? Take time to think and then respond according to your choice not your feelings. I realised that even though I was healed from depression I was still behaving the same as before. My behaviour was conditioned, it was learned behaviour. It was not caused by depression but by habit. I was so used to responding to certain things in certain ways that I continued to do so and would continue to do so with our without depression unless I did something about it. It hasn’t been easy and I continue to work on this and am finding more and more freedom as time goes by. Sadly I also see patterns emerging in my youngest daughter and am doing my best to work on her behavioural responses and choices now already at seven years old so that she doesn’t have to suffer as I have most of my life. Perhaps she has learned some behaviour from me, which saddens me, some may be spiritual inheritance, some temperament and who knows what else but I am determined to give her the best shot at life as possible by helping her learn and master her choice and behaviour. So for example you may find that every time you get angry you behave in a certain way, you cry or you shout or you storm off like a two year old. Whatever your reaction you know that it’s simply a learned behaviour and not necessarily the right thing to do. Perhaps you look out the window and start crying, feeling sad, so you lay in bed and find it difficult to get up. Are you really sad and struggling to get up or are you so used to being sad that you just get sad by default now? Try change your behaviour. Get up anyway, go for a walk and meditate on something positive. Use your choice to change your behaviour. It’s easier said than done but it’s possible. The mind is the battlefield. I preached on Battle of the Minds in 2010 – have a look and see if you find anything useful there too. Ask the Holy Spirit to help you, to teach you and to show you what you need to work on and what to leave. There are times when he does something amazing from the inside out and there are times when you need to renew your mind as it says in Romans 12:2 When we have a response to something it feels real to us at the time. It takes incredible effort at first to realise that it’s not real, it is just one side of the coin, one viewpoint. There are often many angles to just one situation. Here are a few practical tips that I found useful to help me break that false reality and see things as they really are. Whenever you feel like you are struggling in any way just stop and pray. Your prayer can be as short and simple as, “God help!” or a nice long conversation with your Daddy in heaven who loves you. There are no rules so turn to him in your own way. I find that many times I get overwhelmed by an emotional response to something and if I forcibly distract myself then I can very quickly put things in perspective. Sometimes it can be as simple as walking away from a person or situation or it can be a complete change of scenery or activity. Put on a worship song, do your favourite hobby, watch a funny TV program – do whatever it takes to be distracted so your emotions don’t get the better of you and then you can think clearly and respond to whatever caused the emotions in a healthy way. “The Bible is living and active…” – Hebrews 4:12 The Bible is like probiotic yogurt, once you get it inside of you it does wonders for your system! You may not feel it at first but you cannot go wrong by reading and meditating on the Bible. Take one verse at a time to memorise it to get it inside of you and read sections at a time as a story too. I haven’t given many examples as it is different for everyone. Let us know what you struggle with, what do you now see as learned behaviour that needs changing? *** Please use your common sense, only you know where you are at on your journey with depression, there is nothing wrong with medication – I took anti-depressants for over a year and it was a welcomed break from all the hard work I have done to beat depression. I feel stronger and ready to do all I have mentioned above. There is no condemnation in this, just know that God works in many ways and you need to follow His guidance as He leads you in the way you should go. He lead me to anti-depressants for a season and I am so grateful as it has helped me so much. But now I want to move forward without them because that’s what I feel is right for me. You must figure out what is right for you too. I hope this helps someone – I know it’s helped me.